Click On the pictures to enlarge to fullscreen. Bilder anklicken um Vollbild Version zu sehen. On November 04th 2005 Get Your Number will be released as the third single from the album The Emancipation Of Mimi in Germany. Click here for the chartdata. Am 04. November 2005 wird Get Your Number als die Dritte Single vom Album The Emancipation Of Mimi ver�ffentlicht. Klickt hier f�r die Chartdaten. On July 09th, 2005 I had the great pleasure to see Mariah performing live at an open air concert in Karlsruhe. Like many of you already noticed Mariah is vocally in best form. Especially We Belong Together is so emotional and fits perfect Mariah's great vocal talents. The opener was of course It's Like That and also the 3rd song from TEOM Shake It Off was fabolous. As a special gift to many of the dedicated fans on the concert Mariah performed Close My Eyes from the Butterfly album. Am 09. Juli 2005 hatte ich das grosse Gl�ck Mariah Live In Concert in Karlsruhe zu erleben. Mariah ist stimmlich in absoluter bestform und im Vergleich zur Rainbow Tour anno 2000 hat Mariah showtechnisch sehr viel bei der 69 Konzerte Tournee im Jahr 2003 und 2004 dazugelernt. Besonders We Belong Together kommt live absolut fantastisch und emotionell r�ber. Als Opener kam nat�rlich It`s Like That und heizte die Stimmung sehr gut an. Der besondere Leckerbissen war Close My Eyes vom Butterfly Album der sehr selten live performte Lieblingssong von den aus ganz Europa angereisten Fans. Es ist wirklich sehr schade und oberaus peinlich dass die deutschen Medien nur �ber die Panne mit dem Kleid bei der ersten Zugabe ausliesen. Ich stand in der dritten Reihe und es gab �berhaupt nichts besonderes zu sehen da das Kleid so eng war dass es auch ohne Tr�ger hielt. On July 09, 2005 Mariah will give a concert in Karlsruhe and on July 12, 2005 she will be in Bonn. Tickets are available at Eventim. The screen capture is taken from Mariah's performance of the current Number One hit We Belong Together at the MTV Movie Awards 2005. Am 09. Juli 2005 wird Mariah ein Konzert in Karlsruhe und an 12. Juli 2005 eines in Bonn geben. Tickets gibt es bei Eventim. Der Screen Capture ist von Mariah's Performance ihres Nummer Eins Hits We Belong Together bei den MTV Movie Awards 2005 (RTL2 News, 06.06.2005, 20:14). Currently Mariah is in the USA as successful as in her most successful years back in the 90's. We Belong Together is Mariah's first No. 1 since Thank God I Found You five years ago and is already one of Mariah's most successful airplay hits ever. Additionally the album The Emancipation Of Mimi is certified Double Platinum just six weeks after it's release! Click here to see chart positions from around the world. Im Moment ist Mariah in den USA so erfolgreich wie in ihrem erfolgreichsten Jahren in den 90ern. We Belong Together ist Mariah`s erste No. 1 seit Thank God I Found You vor f�nf Jahren. Zus�tzlich verkauft sich das Album The Emancipation Of Mimi sensationell gut und ist schon sechs Wochen nach Ver�ffentlichung mit Doppel Platin ausgezeichnet. We Belong Together kommt am 27. Juni 2005 in unsere L�den. Klickt hier f�r den Blick auf alle Chart Positionen. We Belong Together is the second single from the album The Emancipation Of Mimi. The song is already at Number 3 on the Billboard Hot 100! In Germany the single will be commercially available on June 20th, 2005. We Belong Together ist die zweite Single vom Album The Emancipation Of Mimi. Der Song ist jetzt schon ein Riesenhit in den USA und ist sicher der Grund warum sich das Album sensationell gut verkauft. Das Album hat in nur vier Wochen die Millionengrenze �berschritten! Deutschland muss sich noch etwas gedulden: Die Single wird am 20. Juni 2005 ver�ffentlicht. In the USA the album The Emancipation Of Mimi sold 403.755 copies! Not only Mariah's best first week sales - it's also Mariah's first Number One album since Butterfly debuted at Number One with 235.000 copies sold. Together with top chart entries from all over the world makes it this weeks Number One on the United World Chart Top 40 Album Chart. In den USA verkaufte sich das Album The Emancipation Of Mimi gleich 403.755 mal. Somit ist es nicht nur Mariah`s Album mit dem besten Verkaufsstart - es ist auch das erste Nummer Eins Album seit 1997 Butterfly mit 235.000 Kopien startete. Zusammen mit den Top Chart Platzierung auf der ganzen Welt ist das die Number Eins in den United World Chart Album Chart. On April 07, 2005 MTV Germany had a report in the news about famous makeovers like in the new tv hit serie Verliebt In Berlin (Falling in love in Berlin). Among the famous the persons asked to this theme was also Mariah Carey. Am 07. April 2005 zeigte MTV einen Bericht �ber die TV Hit Serie Verliebt In Berlin (Sat1, Mo-Fr 19:15 Uhr). unter den zum Thema gefragten ber�hmten Pers�nlichkeiten war auch Mariah Carey. Sie sagte die Leute lieben Geschichten in denen unauff�lliges M�dchen zum sch�nen Schwan verwandelt. On April 02, 2005 Mariah performed It`s Like That at Europe's biggest music award show - The German Echo Awards 2005. It was fantastic performance. Mariah had a lot of fun and it was kinda exciting to see her dancing in high heels. Click here for more screen captures. Am 02. April 2005 performte Mariah It`s Like That bei den Echo Awards 2005. Es war eine grossartiger Auftritt. Man sah dass Mariah sichtlich Spass daran hatte und es irgendwie aufregend zu sehen wie Mariah in den High-Heels tanzte. Klickt hier f�r mehr Screen Captures. On April 02, 2005 German televison RTL showed Mariah`s performance in Top Of The Pops which was recorded in London a few days ago. The singles makes a very good debut at Number 21 on the Germany Singles Sales chart. Am 02. April 2005 zeigte RTL Mariah`s Auftritt in Top Of The Pops den Sie vergangene Woche in London aufgenommen hat. Die Single steigt auf 21 in die Deutsche Single Hitparade ein. On April 02, 2005 at 09:30 h in the morning German music channel VIVA broadcast a half hour special in which Mariah personally some of her most successful (in Germany) Without You, Against All Odds and Mariah's favourite Heartbreaker, Fantasy (with ODB) vides. And of course they played the newest It`s Like That. Note: Instead of playing the Fantasy video with ODB they played an Top Of The Pop performance from 1995 without ODB. Am 02. April 2005 zeigte VIVA um 09:30 Uhr morgens ein halbst�ndiges Planet VIVA Spezial in dem Mariah pers�nlich einige ihrer erfolgreichsten Videos in Deutschland (Without You, Against All Odds) und ein paar von Mariah`s Lieblingsvideos (Heartbreaker, Fantasy (mit ODB)) ank�ndigte. Nat�rlich wurde auch It`s Like That gezeigt. Anstatt wie Mariah ank�ndigte das Video mit ODB zu zeigen, wurde eine Top Of The Pop Performance von 1995 gezeigt. On March 03rd, 2005 Mariah was guest in the MTV USA show TRL to premiere her new video It`s Like That. MTV Germany used it for some kind of funny April fools joke. Am 03. M�rz 2005 war Mariah bei dem original MTV TRL in New York am Times Square zu Gast um die Video Premiere von It`s Like That anzuk�nden. MTV Deutschland missbrauchte den Auftritt f�r einen komisch-lustingen Aprilscherz. On March 30th, 2005 MTV Germany showed a report/interview that Mariah will sell some of her exclusive gowns on eBay for charity. Mariah supports since the early 90`s The Fresh Air Fund that allows inner city kids to make holiday on the country (Camp Mariah). Am 30. M�rz 2005 zeigte MTV ein kurzen Bericht/Interview dass Mariah einige ihrer nur einmal in der �ffentlichkeit getragenen Kleider bei eBay versteigern wird. Mariah unterst�tzt schon seit den fr�hen 90er Jahren den Fresh Air Fund dass Grossstadtkindern Urlaub in einem Feriencamp (Camp Mariah) auf dem Land erm�glicht. While her visit in Germany on March 19th Mariah was guest on MTV Germany`s TRL. The theme was Friends Of Mariah. As a big fan of Mariah's R&B Songs and Remixes I am very happy that finally a show on German television honours that great side of Mariah. They showed videos of Kanye West, Nelly, Jay-Z and Snoop Dogg. W�hrend ihres Besuches in Berlin am 19. M�rz war Mariah auch zu Gast in MTV TRL. Das Thema war Friends Of Mariah. Als grosser Fan von Mariah's R&B Songs und Remixe bin ich sehr froh dass endlich auch diese Seite von gew�rdigt wird. Es wurden Videos von Kanye West, Nelly, Jay-Z and Snoop Dogg gezeigt. Tomorrow is Mariah's Birthday. Internationally the album The Emancipation Of Mimi will be out on April 04th and on April 12th in USA. Morgen ist Mariah`s Geburtstag. In wenigen Tagen (Am 04. April 2005) wird Mariah`s zehntes regul�res Studioalbum erscheinen. The Emancipation Of Mimi kann bei Amazon.de als Deluxe und normale Edition vorbestellen. After her visit in Germany on March 19th, 2005 Mariah spends a few days in London to promote It`s Like That. Nach ihrem Besuch in Berlin am 19. M�rz 2005 verbringt Mariah ein paar Tage in London um die neue Single It`s Like That zu bewerben. On March 14th, 2005 MTV Germany showed a report about the video shoot for the It`s Like That. Am 14. M�rz 2005 zeigte MTV Deutschland im News Mag einen Drehbericht vom neuen Video zu It`s Like That. Since March 04, 2005 the new video by Mariah Carey can be seen on music television. It`s Like That already gets great airplay in the USA and is raises the buzz for the new album The Emancipation Of Mimi coming on April 12, 2005 (USA) and April 04, 2005 (Internationally). Seit dem 04. M�rz 2005 wird das neue Video von Mariah Carey von den Musik Sendern ausgestrahlt. It`s Like That hat einen sehr guten Start bei den US Radiosendern und macht neugierig auf das neue Album The Emancipation Of Mimi das am 04. April 2005 (International incl. Deutschland) erscheint. Klick hier um noch mehr Screen Captures zu sehen. On May 08, 2004 Mariah won the RTL Top Of The Pops Top Voting. Over 70% of the viewers wanted to see Mariah and not Whitney Houston. So the performance of Without You from 1994 was showed. Read my report on Mariah performance of Heartbreaker and Thank God I Found You in 1999. Am 08. Mai 2004 gewann Mariah das RTL Top Of The Pops Top Voting. Mehr als 70% wollten Mariah und nicht Whitney Houston sehen. Deshalb wurde die Performance von Without You aus dem Jahr 1994 gezeigt. Lest meinen Bericht als Mariah Heartbreaker and Thank God I Found You 1999 zum besten gab. On February 24th, 2004 Mariah gave an sold out concert (over 5000 people) in Beirut. Today the Charmbracelet World Tour comes to a final show in Dubai. The more than 70 (seventy) concert tour started on June 21, 2003 in South Korea, went through Japan, USA, Russia, Sweden, Germany, Austria, Switzerland, Scotland, England, France, Italy, China, Philippines, USA (again), South Korea (again), Indonesia, Thailand, Malaysia, Lebanon and United Arabian Emirates. WOW! And everywhere Mariah went it was a big success. I saw seven shows and everytime I had a really good time. Let's hope this show will be out on DVD soon. Click here for more sceen captures showing Mariah in Beirut. Am 24. Februar 2004 gab Mariah ein ausverkauftes Konzert (5000 Leute) in Beirut (Libanon). Heute findet das letzte Konzert der umjubelten Charmbracelet World Tour in Dubai in den Vereinigten Arabischen Emiraten statt. Die mehr als 70 (siebzig) Konzerte dauernde Welttournee startete am 21. Juni 2003 in Seoul (S�d Korea), ging durch Japan, USA, Russland, Schweden, Deutschland (3 Konzerte! ), �sterreich, Schweiz, Schottland, England, Frankreich, Italien, China, Philippinen, USA (nochmal), S�d Korea (nochmal), Indonesien, Thailand, Malaysia, Libanon and Vereinigte Arabische Emirate. WOW! Und �berall war es ein grosser Erfolg. Ich habe die Show sieben mal gesehen und hatte jedesmal eine sehr gute Zeit. Bleibt nur zu hoffen dass es bald eine DVD mit der Show gibt. 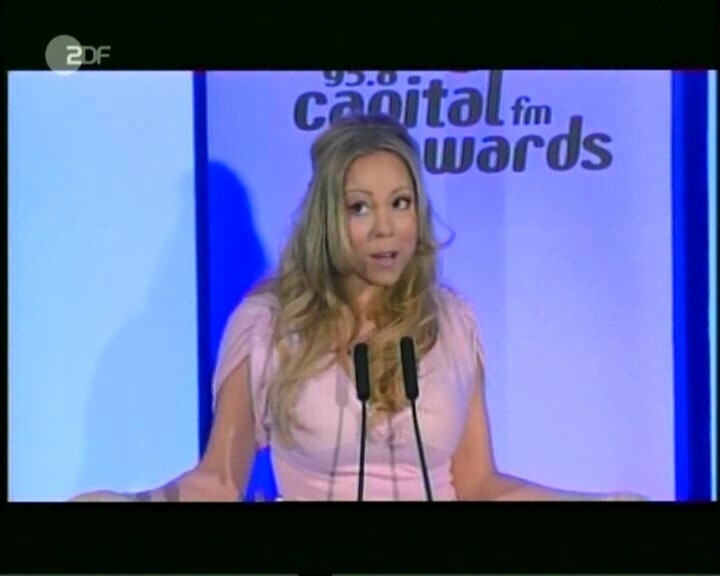 Klickt hier um noch mehr Screen Captures von Mariah in Beirut Berichten zu sehen. On February 14th, 2004 Mariah received the MTV Asia Lifetime Achievement Award. Asia is the second biggest market behind the USA for Mariah Carey CDs. Currently Mariah is giving concerts in Asia. Am 14. Februar 2004 bekam Mariah den MTV Asia Lifetime Achievement Award. Nach den USA ist Asien der Markt auf dem die meisten Mariah Carey CDs verkauft werden. Zur Zeit ist Mariah wieder auf Tour in Asien. On February 08, 2004 at 20:15 h the movie with Mariah's first movie role ever is first shown on free German television (Pro7). Am 08. Feburar 2004 um 20:15 Uhr k�nnte Ihr zum ersten mal den Film mit Mariah's allererster Filmrolle im Deutschen Free-TV sehen. In der Liebeskom�die aus dem Jahr 1999 mit Chris O`Donnell und Renee Zellweger spielt Mariah die Operns�ngerin Ilana (ca. 2 Min). Since November 24, 2003 the movie finally came out on DVD in Germany. In this mob thriller Mariah plays waitress Raychel along with Academy Award Winner Mira Sorvino and Melora Walters. The movie was made in spring 2001. Seit dem 24. November 2003 ist der Film endlich auch in Deutschland auf DVD erh�ltlich. Mariah Carey spielt in dem Mafia Thriller die Kellnerin Raychel. In dem spannenden Film geht es um ein Restaurant das von der Mafia betrieben wird. Aber auch um Freundschaft und die st�rke von drei Frauen (Mariah, Oscar Gewinnerin Mira Sorvino und Melora Walters). Die DVD enth�lt auch ein 25 Min�tiges Making-Of. Der Film wurde bereits im Fr�hling 2001 gedreht und zeigt Mariah in einer anspruchsvollen Rolle die Mariah mit bravour meistert. The cover of the Def Leppard classic is surely a special highlight on the Charmbracelet World Tour. As Mariah's only rock song it surprised many people in the audience. Never thought Mariah could sing that loud and the song showed what the great sound system Mariah has can do. And of course the live band was able show their talent. Especially drummer Gigi Goneaway and Vernon "Ice" Black with an awesome guitar. Click here for lyrics and screen captures. Das Remake vom Def Leppard Klassiker war ein tolles Highlight auf der Charmbracelet World Tour. Als Mariah's einziger Rocksong war es sicher eine �berraschung f�r viele Konzertbesucher. H�tte nicht gedacht dass Mariah so laut singen kann und das excellente Lautsprecheranlage brachte es auch gro�artig r�ber. Und nat�rlich konnte die Band zeigen was in ihr steckt. Besonders Drummer Gigi Goneaway und nat�rlich Vernon "Ice" Black mit einem sensationellen Guitarrensolo. Klickt hier f�r Text und Screen Captures. On October 16th I (front, left with Urban Tour T-Shirt) was among the lucky fans who won an Meet & Greet with Mariah Carey by Honey B. Fly. The autograph gave me Mariah after the concert in Milan, Italy on November 7th, 2003. Am 16. Oktober 2003 war ich (vorne links im Urban Tour-T-Shirt) einer der gl�cklichen Gewinner des Meet & Greet mit Mariah Carey nach dem Konzert in M�nchen. Das Autogramm gab mir Mariah nach dem Konzert in Mailand am 07. November 2003. On October 12th, 2003 got a Diamond Award for 150 million albums sold worldwide. In her receptions speach Mariah mentioned all the charity works the World Music Awards foundation does and the only thank you she gave out was to the FANS! Am 12. Oktober 2003 bekam Mariah Carey den Diamond Award f�r �ber 150 Millionen verkaufter Alben weltweit. In Ihrer Preisannahmerede erw�hnte Mariah die Wohlt�tigkeitsprojekte der World Music Awards Foundation. Die FANS waren die einzigen bei denen sich Mariah bedankte. Klickt hier um mehr Screen Captures zu sehen. This picture I made while Mariah leaving the hotel the day after a much celebrated concert in Hamburg on October 10, 2003. Vocally Mariah was at the ballads absolutely stunning, to the uptempos everybody danced, clapped and sang along. I was really surprised how great the audience (not only the fans) reacted to the show. When Make It Happen came on it was party all over! More pictures and report on the tour. Dieses Bild machte ich als Mariah das Hotel nach dem triumphalen Konzert in Hamburg am 10. Oktober 2003 verlies. Stimmlich war Mariah bei den Balladen einfach �berw�ltigend, zu den Uptempos wurde getanzt, geklascht und mitgesungen. Ich war ehrlich �berrascht wie das Publikum (nicht nur die Fans) auf das Konzert reagierte. Zu Make It Happen kam es wie eine Riesengrosse Party vor! Mehr Bilder und ein ausf�hrlicher Bericht. On October 04th Mariah Carey visited the fashion show by Donatella Versace in Milan, Italy. In a short interview Mariah said she's looking forward to see the fans in Germany next week. After concerts in Stockholm on October 05th and in Rotterdam on October 08th Mariah will be in Hamburg (Oct. 10), Berlin (Oct. 13) and Munich (Oct. 16). Click here for screen captures. Am 04. Oktober besuchte die Modeschau von Donatella Versace in Mailand, Italien. In einem kurzen Interview sagte Mariah sie freue sich die Deutschen Fans n�chste Woche zu sehen. Nach Konzerten in Stockholm am 05. Oktober und in Rotterdam am 08. Oktober wird Mariah in Hamburg (10. Okt. ), Berlin (13. Okt.) und Munich (16. Okt.) gleich drei Konzerte auf Deutschem Boden geben. Hier klicken um mehr Screen Captures zu sehen. After Asia and North America Mariah Carey will be touring Europe this October with dates in Russia, Sweden, Netherlands, Germany, Austria, Switzerland, Great Britain, France and Italy. Vocally Mariah is in bestform and the show is focused on Mariah's countless world hits. Surely a must see not only for Mariah fans, also music lovers and fans of beautiful voices with have their share. The Picture is from the concert at Radio City Music Hall in New York City. Nach Asien und Nord Amerika wird Mariah Carey die Tour diesen Oktober nach Europa bringen mit Auftritten in Russland, Schweden, Niederlande, Deutschland (Hamburg + Berlin + M�nchen! ), �sterreich, Schweiz, England, Frankreich und Italien. Stimmlich ist Mariah in Bestform und die Show ist fokusiert auf Mariah's zahlreichen Welthits. Sicher ein Muss nicht nur f�r Mariah Fans, sondern auch f�r Musik Liebhaber und H�rer von sch�nen Stimmen werden ihren Spass haben. Das Bild stammt vom Konzert in der Radio City Music Hall in New York City.